A wolf dog is a combination of wolf and dog. A Wolfdog, also known as a ‘wolf hybrid’, is simply a dog that has wolf in its family history. While it is widely understood that all dog breeds have descended from the wolf, a Wolfdog has pure wolf recently in its background, such as a parent or great grandparent (Whereas your family dog may have to go back hundreds of generations to pure wolf). Genetically, the wolf and the dog are the same species – thus they are not actually ‘hybrids’ (for a human comparison, a wolf and a dog are no different than a person of Asian decent is different from a person of European descent) A wolf can mate with a dog and produce fertile offspring, just like two different breeds of dog can mate and produce fertile offspring. Offspring of two different breeds of dog, affectionately known as a ‘mutt’, will have characteristics of the two breeds, in varying proportions. Likewise, offspring of a wolf and-and a dog will have characteristics of a wolf and that particular breed, in varying proportions. Today’s wolfdogs are not the result of a wild wolf bred with a domestic dog. They are the result of dozens or more generations of wolfdogs bred with wolfdogs. Decades ago wolf breeders in the fur trade sold pure wolves to zoos, exhibitionists, and the public. While these commercial breeders no longer exist, many of these private owners still breed wolfdogs. Most domestic bred wolfdogs can trace their lineage back to the fur farms as far back as the 1950’s. No two wolfdogs are alike. There is no breed standard. Wolfdogs, for lack of a better term, are ‘mutts’: wolf mixed with another breed, or several breeds, of dog. Usually, they are a combination wolf with Siberian husky, Alaskan malamute or German shepherd, but can be mixed with other breeds as well. 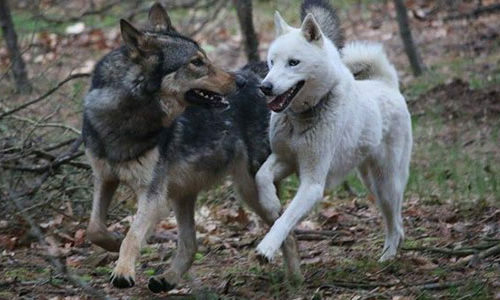 Wolfdogs will behave like wolf and the breed of dog they are mixed with. The wolf part tends to be shy with strangers, cautious, curious, intelligent, playful, watchful and energetic. They can also be stubborn, loving, independent and aloof. They are almost always very loving and loyal to their ‘family’ pack. The dog part will have behavior reflective of that particular breed in the mix. So every wolfdog is different. Even wolfdogs from the same litter and can look and behave differently, individually inheriting physical and behavioral characteristics from various wolf and dog forbearers.